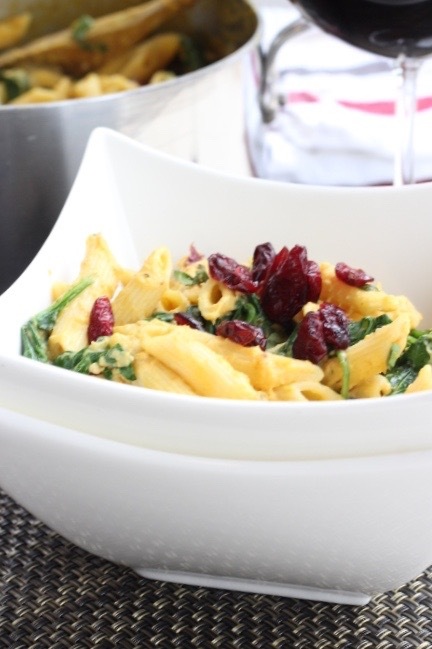 Organic penne pasta with a pumpkin cream sauce tossed with warm fresh spinach and dried cranberries. 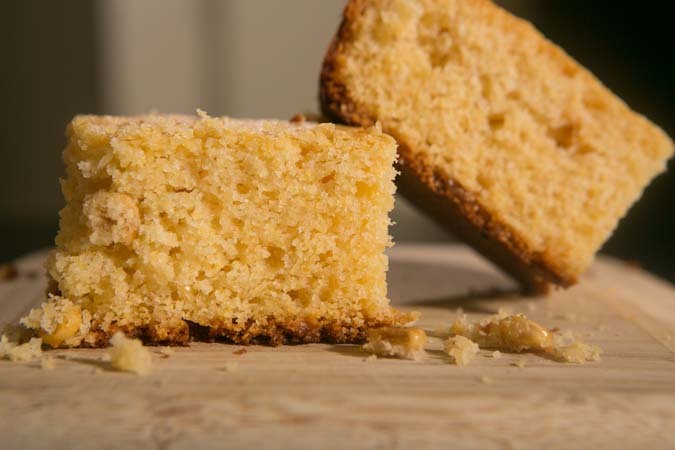 Made entirely with O Organics® ingredients. Our new apartment has a pantry. A really, really nice pantry with vintage built in drawers and cabinets and shelves on shelves on shelves. Not only does having a pantry mean that I can stock it full of spices, sauces, canned goods, snacks, bakeware, cookware and linens, it means that I can shop in bulk, shop sales and cook dinner with the ingredients available in said pantry. When I cook at home, I’m all about knowing that I’ve used the best possible ingredients. 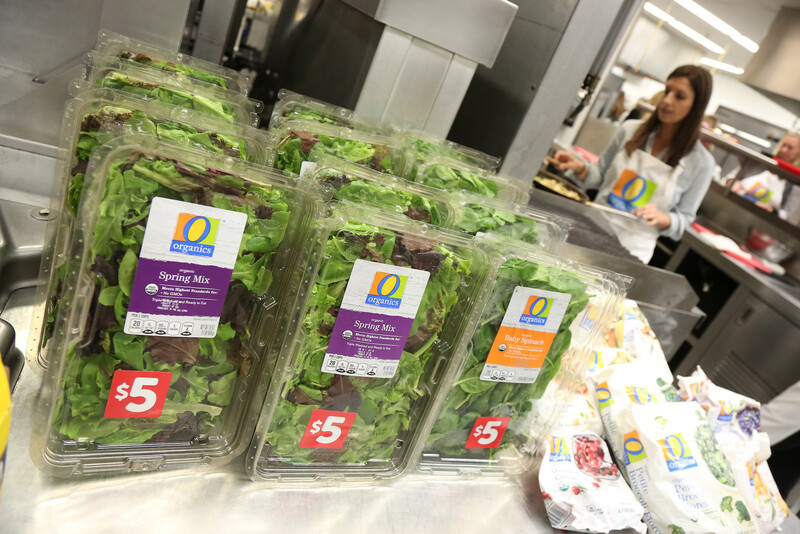 Jewel-Osco’s O Organics line incorporates fresh fruits and vegetables, wholesome dairy and meats, cereals, snacks and more. 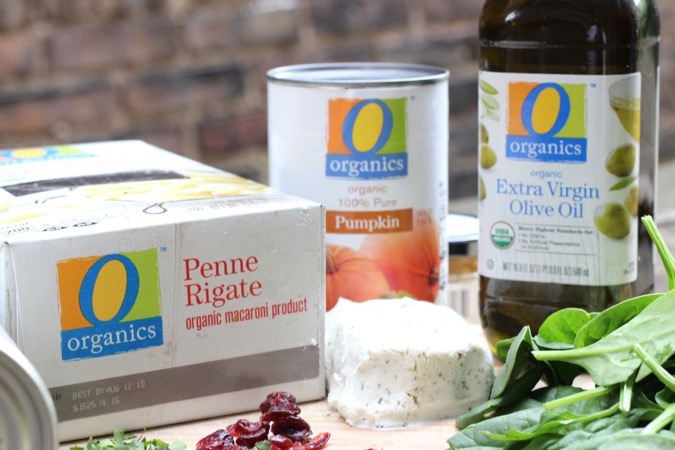 Going organic doesn’t have to be a long and expensive process and incorporating select organic items into your diet, doesn’t take a lot of time, money or effort — it can be easier than you think! 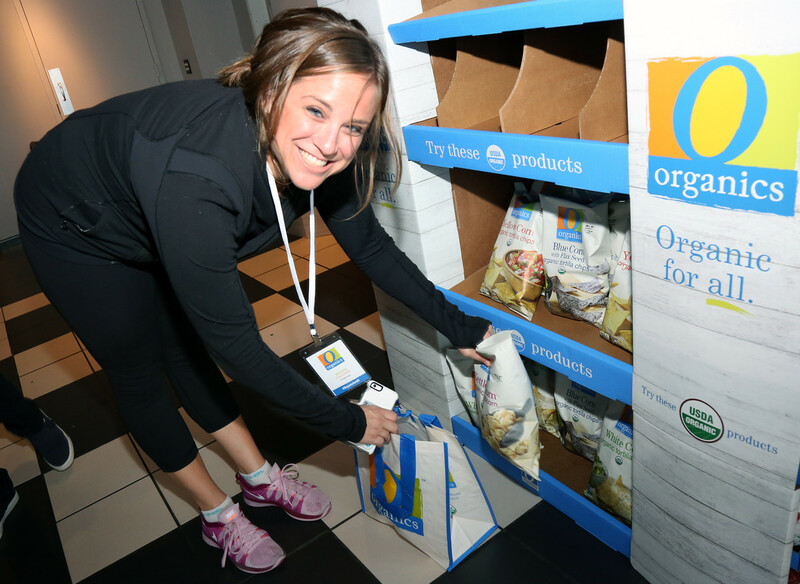 With the wide variety of products offered by O Organics, there are so many easy ways to incorporate organic foods into meals. 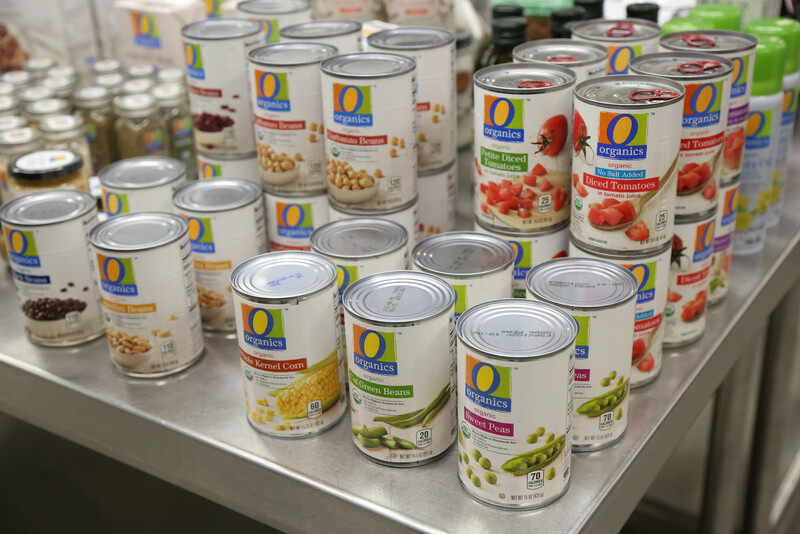 Last week I joined Jewel-Osco at Kendall College Culinary School in Chicago to celebrate its O Organics product line. 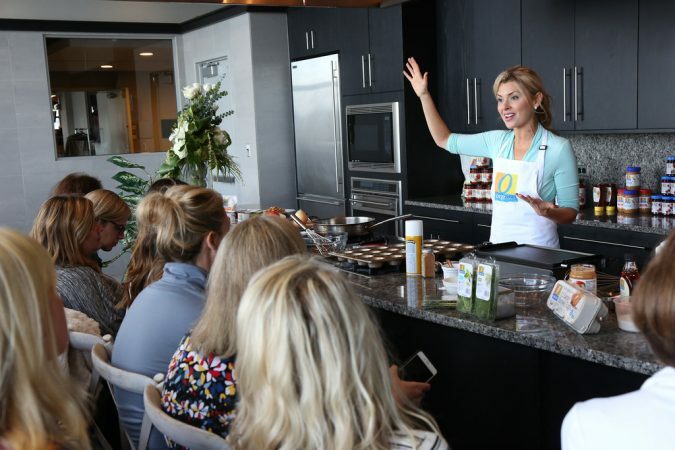 The ‘Organic for All™’ event included dining, cooking, recipe demonstrations, shopping and yoga. I’m not going to lie, if I could find a way to make this my agenda every day, I think I would. I mean, just look how excited grocery shopping makes me. #CrazyHairDontCare. 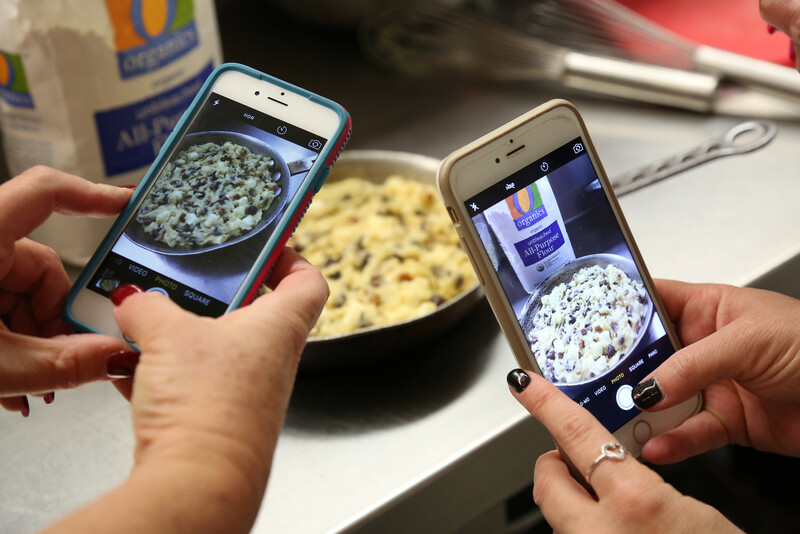 During the day with O Organics, the group had the opportunity to pair off into small groups and create from-scratch recipes with O Organics products. There were a lot of wonderful dishes created — I paired off with Kristy from The Wicked Noodle and Martha from A Family Feast to create a fall inspired vegetarian three bean chili topped with cheddar cheese and Greek yogurt. 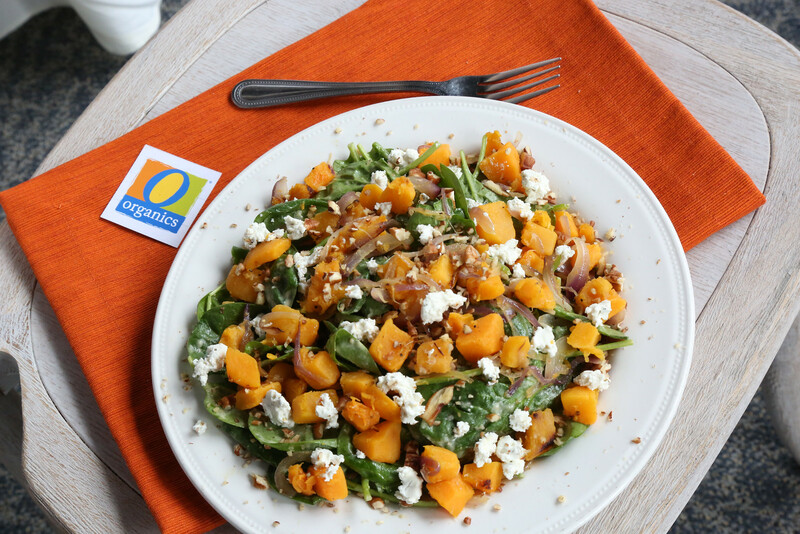 Elsewhere in the kitchen, my friends Lauren from Lakeshore Lady and Kit Graham from The Kittchen made a beautiful butternut squash and spinach dish topped with caramelized onions and goat cheese. I won’t lie, I’ve been dreaming about it ever since. After a business trip this week, I raided our freshly stocked, much beloved pantry and concocted a pasta dish for dinner that was so simple to make, took all of 20 minutes hands on time, if even that. After a busy week of flights and meetings and more flights, all I wanted was simple comfort food. If you’re thinking what I’m thinking, then I’m thinking penne pasta, fresh spinach and pumpkin cream sauce. 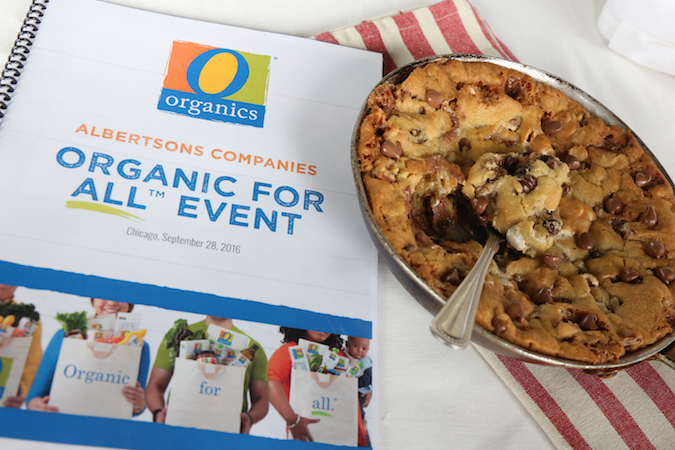 At the ‘Organic for AllTM’ event I had the opportunity to work with a vast selection of O Organics products, but please check your local Albertsons family store to see what’s available in your area. Cook pasta in a large pot of boiling salted water until al dente; drain pasta and set aside. In a large skillet, heat oil and butter over medium. Add garlic and cook until aromatic, then add pumpkin puree, whole milk, Parmesan. Stir sauce until heated through, 2 to 3 minutes. Add pasta to sauce, and toss to coat. If sauce is too thick, add some more milk. Add spinach and cranberries to the skillet and cook until wilted. Season generously with salt. 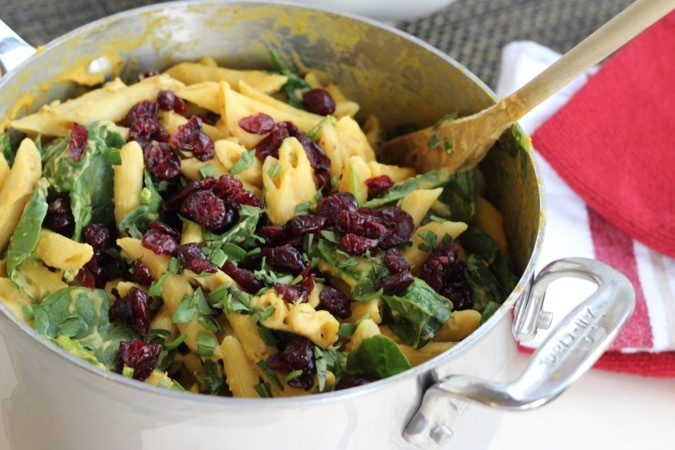 Serve pasta sprinkled with rosemary and tarragon, and more cranberries if desired. 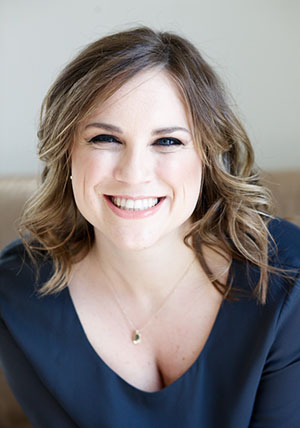 Thank you to Jewel-Osco for sponsoring this post. All opinions are my own. Never thought of adding cranberries to my pasta before. I sure will next time. Such a great idea! What a fun trip and perfect pasta dish! I’m pretty sure that this pasta is going to make my Thanksgiving day menu! Sounds like a delicious pasta! I’d definitely love a bowl (or two)! P.S. The pumpkin puree amount isn’t listed in the ingredients. This sounds absolutely delicious! I love the pumpkin/cranberry/spinach combo! Perfect for fall! 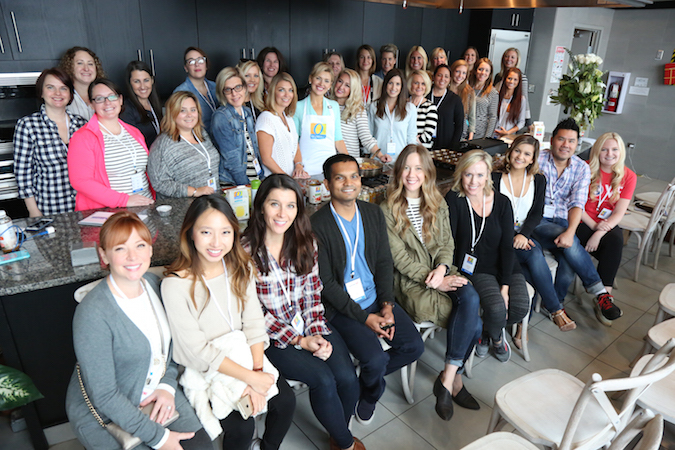 The meeting looks so fun and for such a great organic line! Love the tarragon in the pasta! Love the Fall spin on this pasta! 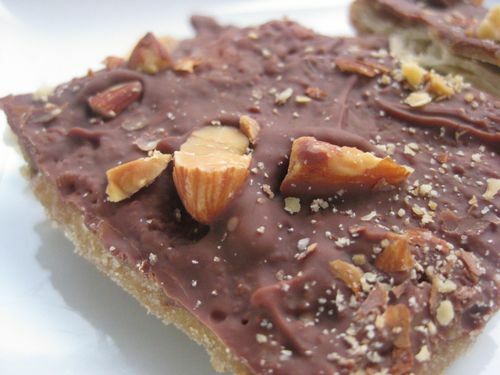 I will most definitely be making this. Looks delicious!!! What a fun night! Cranberries are around again! It is fall, this dish looks like a crowd pleaser. This pasta recipe is incredible! And what a fun event! This looks incredible! I love the addition of the cranberries for sweetness and texture. Cannot wait to try this! WHAT?! Oh my gosh! I love the cranberries! Such an amazing combination of Fall flavors!! I love all these flavors…I would never had thought to combine them! I think I need to try this! 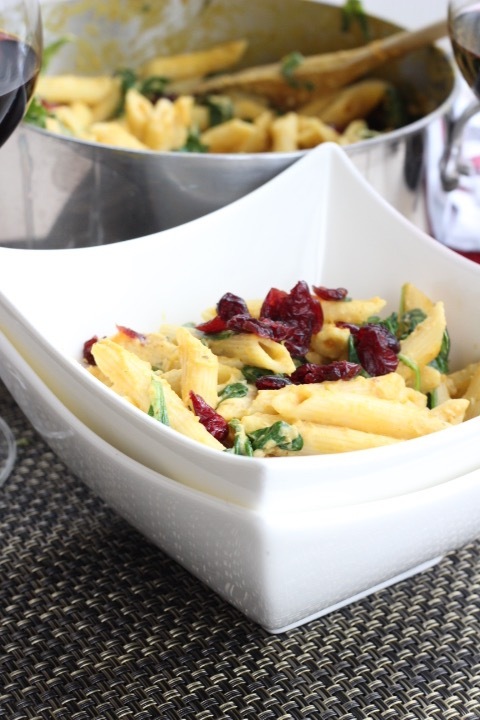 One of our Fall favorites is a pumpkin pasta, but I have never though to add cranberries! 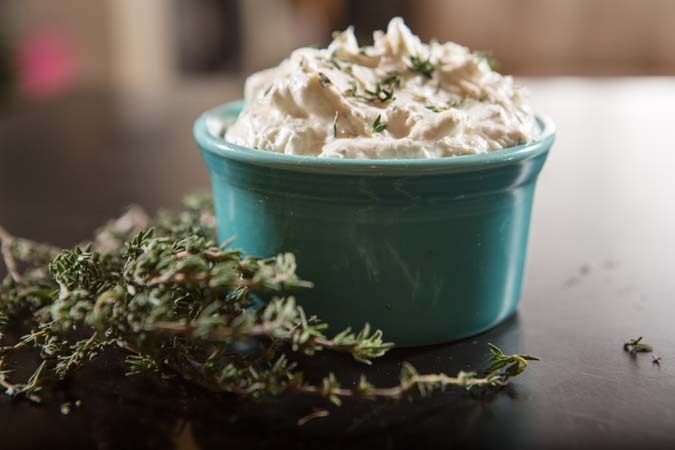 This is the ultimate fall dish!